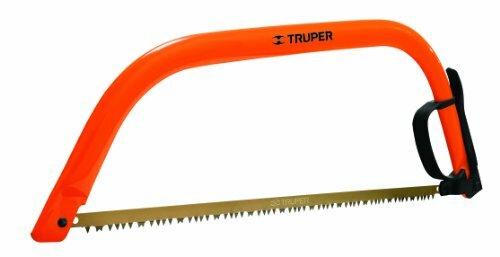 Truper 30255, AJT-21, 21-Inch Steel Handle Bow Saw, Cam Lever Quick Change Blade Release, Orange. 21-inch Handy Bow saw for larger branches. Cam-Lever Tension system keeps the blade perfectly tight while you're working in the field. Clean equipment after each use and oil for-year of trouble free use. A must have tool in any gardeners shed or garage.. Stock up on quality Truper Tools for other projects today. Truper has been in the hand tool manufacturing business for over 40-year and is by far the largest Mexican company in its field. Truper relies on the most advanced modern and efficient technology to guarantee the optimum quality and value of its products and demanding service needs of the company's global customers.